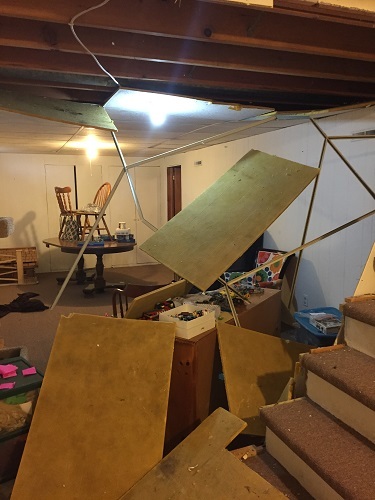 When we bought this house last fall, it was billed as having a “partially-finished” basement. This is probably accurate, though unclear. “Partially-finished” seems to indicate that some sections aren’t really all that usable, and that wasn’t the case here. The below-ground floor was divided into four main rooms: a finished master bedroom; a mostly-finished-though-ugly front room; a middle room that is mainly devoted to water heater and other appliances/pipes/etc; and a back room that is mainly storage due to a lowered ceiling (under the sunken living room) for 3/4ths of it. 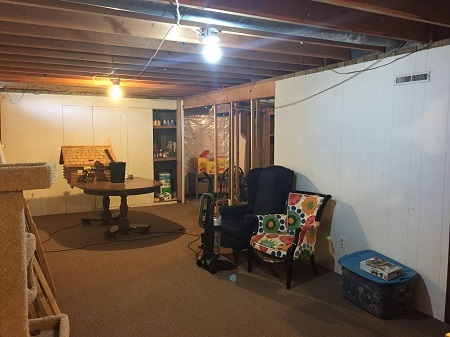 Other than the finished master bedroom, the rest of the basement is ugly, but still either mostly finished or semi-finished. 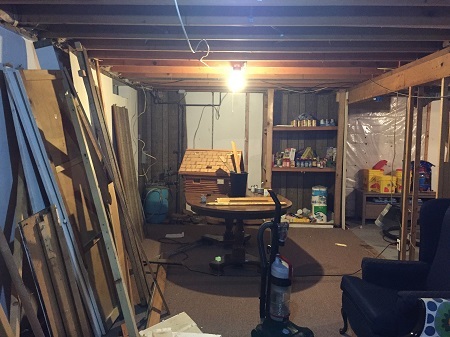 Anyway, point is that we decided to finish finishing the basement, at least as much as can be done. The storage area with the low ceiling (about six feet) will likely never be anything other than storage and weight-bench area, you know? But the rest of it has potential. There are water and sewer lines in the middle room where the laundry used to be, which means we can add a bathroom to the lower level. All the rest will just involve some floor-leveling, room-partitioning, and (major) updating. No more dirty old paneling, flat carpet, and drop ceilings! Earlier this week, we decided to get started by prepping the area that will become the downstairs bathroom. Attached to this is the staircase, which needed to have paneling pulled off to open it up and perhaps even make an eventual book nook! I got a little in-progress photo of this (above). Paneling is visible on the side of the staircase we didn’t (yet) rip out. That paneling used to go all the way from floor to ceiling on the side of the staircase now open. The door on the left will be the entry into the bathroom. Of course, all this construction made for nervous and/or excited cats. One of them – we aren’t altogether sure, but suspect it was Nimi – decided to take advantage of the newly opened path to the rafters. Little did she know that drop ceilings aren’t exactly meant to hold 9-lb cats. 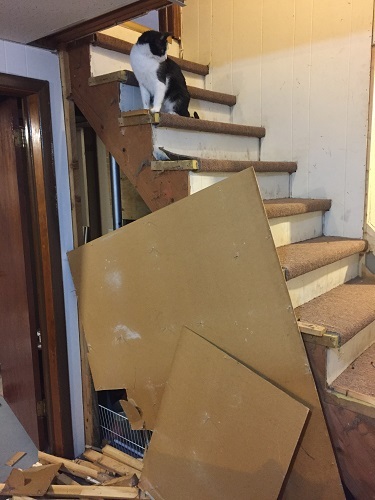 After a loud clatter, during which (thankfully) no cats were hurt, we discovered that our basement now looked like the picture on the left. So this is where I’ll be for the foreseeable future. 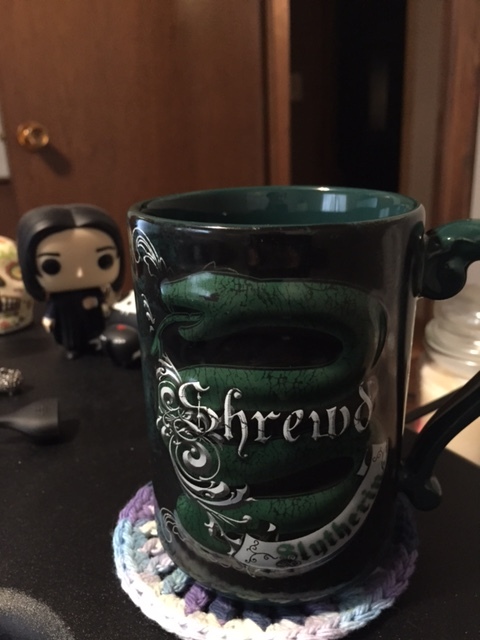 I do still plan to be at the blog, but I might be a bit more sporadic about posting for the next few months. If I disappear too long, give me a shout out to make sure I haven’t buried alive in my own basement, haha! You should definitely have a cupboard under the stairs, like in Harry Potter! But much cozier. I bet your cats would like that. Fun fact about this house: Back in its early days (early 70s), there was a family who lives here with 10 children. 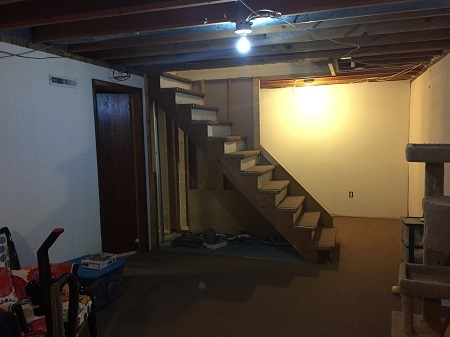 Most of the basement was partitioned up by curtains into bedrooms, but that hollow space under the stairs? There was a door that led into it from the side, and a toddler had his bed in there. He was so excited because he was the only kid to get his own room, even if his room was that tiny, ha! This seems like a HUGE undertaking but it will be so satisfying when it’s done. I can’t wait to see how it turns out! I’m really looking forward to it. The basement is dark now and not my favorite place. I mean, it’s not scary or anything – Ambrose and Laurence both have their bedrooms downstairs – but we haven’t really made it into anything. There’s random furniture and storage items and legos everywhere and all the cat stuff…plus it’ll be nice to have things like the furnace and water heater in their own closet, out of sight! How exciting! I love remodels, especially other people’s, because the before and after is always so dramatic. Plus, they give you a chance to put in your own personality and taste and make a place your own. Yes, they are a complete PITA, but I know you are going to love the results! I hope we can get this one done in a reasonable amount of time. And at least this time it’s not a forced remodel like the last one! No damage or problems – all voluntary! My god, decorating and remodelling stress me out so much so good on ya, girl, for taking this on. To be fair, I’m mostly designing and letting the others do the actual constructing. Remodeling stresses me out majorly as well, but this one needs to happen.